Ferrari F40 (MR020 Version) - Offset: 0N/2W. Lamborghini LP400 - Offset: 1.5N/0W. Lancia Delta (MR010 AWD) - Offset: 0N/0N. Lancia Delta No4 1992 Monte Carlo Winner (MR010 AWD)- Offset: 0N/0N. Audi TT Coupe 3.2 Quattro S-Line Offset: 0N/0N. 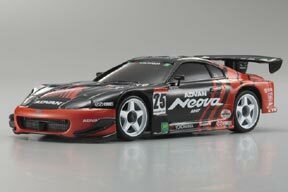 Mazda RX-7 FD3S - Offset: 1N/1N. Nismo Silvia - Offset: - Offset: 0N/0N. Ferrari F50 - Offset: 0N/2.5W. Ferrari 575M Maranello - Offset: .5N/1W. Ferrari F430 - Offset: 1N/1W. Xanavi Nismo Z 2005 - Offset: 1N/1W. ESSO Ultraflo Supra - Offset: .5N/0W. Nissan Fairlady Z - Offset: 0N/0N. Epson NSX 2005 - Offset: 2N/2W. Mitsubishi Lancer Evo X - Offset: 0N/0N. Mitsubishi Lancer Evo X Endless ADVAN CS-X - Offset: 0N/0N. Ferarri 575 GTC G.P.C. Sport - Offset: 2N/3W. Ferrari-F430 (Variant) - Offset: 1N/1W. Nissan Fairlady Z Nismo S Tune - Offset: 0N/0N. Renault Megane Trophy Official Team 2008 (By TRPScale)- Offset: 0N/0W? Renault Megane Trophy "D.Enjalbert" 2008 (By TRPScale)- Offset: 0N/0W? Motul Nismo GT-R Tokachi 24Hour Race - (MR010 AWD) Offset: 1.5N/0W. Nissan GTR - (MR010 AWD) - Offset: 1.5N/0W. Motul Autech Z 2007 - Offset: 1N/1W. Mercedes AMG CLK Original-Teile DTM 2000 - Offset: 2.5N/0W. Mercedes Mobil 1 D2 AMG CLK- Offset:2.5N/0W. Honda NSX Type-R - Offset:? Subaru BRZ Metalic Blue (MR020 AWD)- Offset: 1.5N/1.5N. JKB86_2014 (MR020 AWD)- Offset: 1.5N/1.5N. Ferrari Enzo - Offset: 1N/3W. Lamborghini Murcielago - Offset: 0N/3W. Lamborghini Diablo - Offset: 0N/2.5W. Ford Mustang GT - Offset: 0N/1W. BMW M3 GTR - Offset: 0N/0W. Mercedes Benz SLR McLaren - Offset: 1N/1W. BMW McLaren F1 GTR No.42 Team BMW Motorsport LM 1997 - Offset: 2.5N/3W. McLaren 12C GT3 2013 - Offset: 1.5N/2.5W. McLaren 12C GT3 2013 Synergy Green RS - Offset: 1.5N/2.5W. Aston Martin DB9 - Offset: 1N/2W. DENSO KOBELCO SARD SC430_2012 - Offset: 2N/2W. ZENT CERUMO SC430 - Offset: 2N/2W. PETRONAS TOM'S SC430 - Offset: 2N/2W. Calsonic Impul GT-R-2008 - Offset: 2N/2W. Audi R8 LMS (MR010 AWD) - Offset: 4.5N/2.2W. Absolutely the best racing body! Abarth 500 Assetto Corse - Offset:? VW Golf GTI - Offset: 0N/0N. What makes a good racing body? Nobody knows yet. Aerodynamicst will tell you it does not matter at this scale. Measure the weight of the body, and is not that much difference. Some people think is all psychological, but racers will tell you a body does make a difference. Just put on different bodies, and see the car handle differently. Some bodies make the car more responsive and stick to the track while other seem to float around. In the above picture, the right is the long out of production Mercedes CLK DTM. 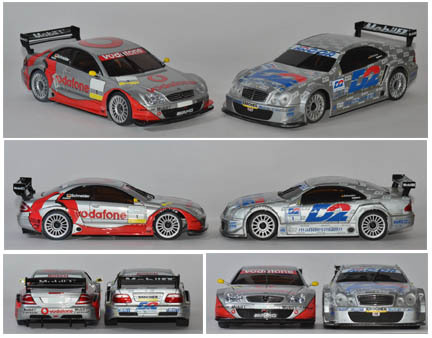 On the left is the current Mercedes CLK DTM. Both are Mercedes coupe with some minor body style change due to model year of the full scale car. However, old timer will tell you the old CLK is a great handling car while the new CLK is a pig. Looking at the pictures, they are very similar. So what made the difference? Nobody really knows. Audi R8 LMS-Best body for racing currently! Enzo- For modified class, the Enzo is popular. It has a +3 offset in the rear that gives it stability. Quick manuvers does not upset the chassis. Give plenty of warning before the rear end lets go. The newer Enzo FXX is similar to Enzo, but has a small rear spoiler. Mclaren-For stock class, Mclaren is popular because it is light weight. Lamborghini Murcielago-Like the Enzo, it has wide rear track. Smooth body lets it bounce off walls. Open Interface Tom's SC430- This is even lighter than Mclaren by a hair. Has good sharp turns in. 94mm gives good traction during acceleration. The air splitter with winglet in front and spoiler in back gives it an aerodynamic edge that is noticeable on the track. The front end of the car slops up like a pan car, so it has good down force in the front. However, the sharp air splitter in the front also cause trouble when it snags the wall. Car comes to an instant stop. Takes some careful driving. Quite popular racing body. Ferrari 360 GTC- This is the standard race body. Like the SC430, shorter 94mm wheelbase gives better manuverability. Nice stable predictable car to drive for modified. Does not have as much aerodynamic downforce than the Tom's SC430. Ferrari 430 GTC - The one with the rear spoiler and not the regular 430 is a very good body for racing. Suppose to be even better than the similar looking 360 GTC. Takata Dome NSX- Suppose to be a popular race body in Asia countries. Overhang on front and rear slows down response, and make it easier to drive. The 2004 series have 0N/0W wheel offset. The 2005 series have 2N/2W wheel offset. If available, get the 2005 series rather than the 2004 series for a wider stance. Austin Martin DB9 - With a relatively wide 2mm rear end, this body is starting to become a popular race body. Some people that use this body run it on a 96mm chassis using a special T-plate from Reflex Racing, and just widen the wheel arch to accomodate the shorter chassis. Suppose to be smooth handling. Nissan GT-R 2008 - This is the 98mm version of the GT-R, and not the 94mm version. The 94mm version is the street going car, and the 98mm is the highly modified racing version with air splitter and rear wing. The 98mm version is suppose to have 2mm offset in front and rear. Is a very fast car. Probably good for modified, but may be heavy for stock. McLaren-F1-GTR - This is the longer version of McLaren. Longer due to spoiler in the front and rear. Wide offset and the sloping front make this almost like a pan car. Good for modified. Ferarri Testarosa-Forgiving car to drive. Wide rear gives good stability. Slightly heavy body. Ferarri F40- Is a 90mm short body. When used with the PN 90mm mid motor mount, can be almost as fast as any other race cars. Not as fast with rear mount or high mount. Porsche 934 RSR Turbo 1976 Vallant - Tamiya made a scale model of this full size race car back in 70s. It was their very first RC car. Interesting Kyosho is also making a copy of the same car green color with the same rabbit logo on it. The black Lamborghini LP500S with white stripe line is also a copy of the popular Tamiya competition special RC car of the 70s. Same with the 935 Porsche. You may say is a coincident both companies made the same car, but I think Kyosho is copying Tamiya here. The Lamborghini Jota with 3mm wide rear, you would think would be a good handling car, but is not. Most likely is because of its aerodynamic. The car just don't turn and hug the ground that well. MR010 and MR015 chassis width is 48mm wide both front end and rear end. Width defined as width of the wheel mounting surface. 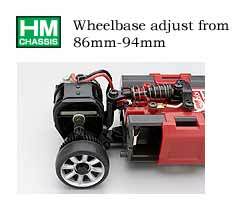 For total vehicle width, add width of wheel, 8.5mm for normal, and 11mm for wide to the chassis width. MR020 chassis on the other hand is 5mm wider in front (53mm), and have same width (48mm) as MR010/MR015 in the rear. Therefore, when using a MR015 body on a MR020 chassis, decrease each front wheel offset by 2.5mm. Rear wheel offset stays the same. In reading the charts, for a MR015 chassis, if you have 2.5N/0W offsets (normal width wheel with 2.5mm offset front and wide wheel with 0mm offset in rear), then front and rear have same vehicle width. For the MR015, the front 2.5mm offset compensates for the narrower front rim, so front and rear wheels line up. Having 0N/0N (0mm offset on both ends with normal width wheels on both ends) will allow front and rear wheels to line up. For an MR020 chassis, if front and back offsets are 0N/0N, then front wheels will actually be 5mm wider than rear, because MR020 chassis are wider in the front. You need 0N/2.5N for the front and rear to have the same width. For typical racing configuration with narrow and wide tires combination, 0N/0W on MR020 will give same vehicle width front and rear; because the wider chassis in front compensate for the narrower tires in the front. LM Chassis: Front is same as MR02 at 53mm. Rear is 4mm wider at 52mm wide. The LM chassis requires a different motor mount and longer length differential than the normal MR02/015 diff. Rear tires on LM are 11mm wide, same as all others. Tire diameter wise, LM is different than MR015,MR020 and MA010. LM has 17mm diameter front rim wrapped with rubber tire that is 3.25mm thick versus for MR02 which has 20mm diameter with 2.5mm of rubber tire (23.5mm versus 25mm OD). Rear is 20mm diameter rims wrapped with 3.5mm thick rubber tire versus 20mm diameter with 2.5mm of rubber for MR02. For MA010 AWD, the wheels are different than the MR015/020 series and are not interchangable. Offset for AWD wheels are measured differently. However, if you are using MR015 chassis with an AWD body, use 2WD wheels with the same numerical offset as the AWD wheels. And for MR020, subtract 2.5mm to the front offset value. MA020 AWD offset is exactly the same as MA010. MR03 offset is exactly same as MR02. Chassis width and offset are confusing, but there is actually a method to the madness. MR020 and MR03 are accepted as the better handling chassis because of the flat battery placement the gives a lower CG. Unfortunately, many mini-z bodes are too narrow for the MR020. It use to be you have a choice between nice bodies or racing bodies. Recently, PN made a narrow front adaptor that lets you have a narrow front stance using the MR020 chassis. Now you can install a MR015 body with 0 offset on a MR020 chassis. MR020 to LM: Rear add 2mm offset to MR020 wheels. Front stay the same. Height wise lower MR02 or MR03 chassis by 1mm in the back, and .75mm in front. With the current production runs, sometimes bodies are hard to come by. You will see popular bodies be available for a month or two, and then most stores will be out of stock. Then you will find them on sale on ebay for a premium. If there is a body you like, when they are available, stock up with a spare. 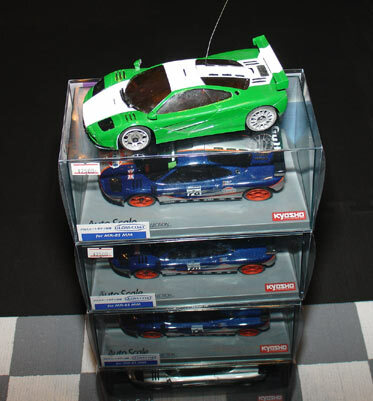 Many people collect Kyosho bodies. However, with price of bodies approaching $50 each, is getting expensive. Wish Kyosho would find a way to lower the price. Caution about paying too much for an out of production body. Kyosho most likely still have the molds. As soon as they turn on the mold again, your investment can come crashing down overnight. Link to Mini-Z Autoscale Database by kyoshosan on Mini-ZRacer.com - Very extensive list of bodies and wheel off-sets.